You may remember that a while back we posted a review/comparison on Schwarzkopf got2b Vs Tigi Bedhead, crowning the former as our new favourite affordable range of hair products. Well a few months down the line Scwarzkopf are back with some new additions to their got2b range and we were lucky enough to get a sneak preview of their latest additions. 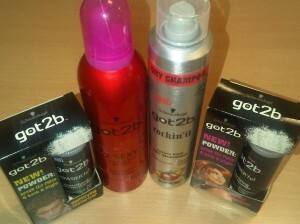 First up we have to mention the got2b Rockin it Dry Shampoo. The dry shampoo market has exploded recently, with every hair care brand imaginable giving it their two cents. So how did Swarzkopf’s offerings stand up to the opposition? First impressions do count, and for us the modern packaging was a refreshing change to the seventies retro feel of Batiste cans. Whats inside the can also did not disappoint, and though when initially sprayed you do get white powder residue which you have massage in (this is more noticeable on brown hair), it is no more or less than you get from other brands. The freshly washed hair look lasts all day and by far the best thing about this product is the delicious scent which is token to all of the got2b range. As you know, it was the 2sexy Collagen Hairspray which first started our love affair with this range, so we were beside ourselves with joy when we heard news of the got2b 2sexy Collagen Mousse. This product is great when used after washing your hair. I used a walnut sized pump and spread evenly throughout my hair, concentrating on really massaging it in around the roots. Then style your hair as you usually would, or for extra volume use a great big barrel brush to inject extra volume into the roots. The mousse contains real hydrolyzed collagen for big time volume and as we keep on saying…it smells really good and looks really good! Last up to face the panel was the got2b POWDER’ful, a styling powder which comes in both a male and female variant to add volume for girls and matt texture for guys. This is really great product and I haven’t actually seen anything else like it in any UK high street stores. To use you simply sprinkle some of the powder into your palms, rub your palms together (the white powder will begin to dissolve)and then run through your roots or wherever you need a volume boost. If you feel like throwing caution to the wind you could even sprinkle the powder straight onto the roots before massaging in. This product is so easy to use that its become a part of my morning routine. I used to get up and give my roots a quick going over with the hairdryer to pump some volume in, but now I can skip that step and just sprinkle, rub and go! The small tube also means that backcombing fiends can leave their brushes and hairspray at home and carry this in their handbags instead for boosts throughout the day and night. For further details of all of the products mentioned, and for a list of stockists, please visit the got2b website here.